This is part one in a series of tutorials I'm going to be doing on how to make terrain in 3ds max. I'll be covering how to set 3ds max up and basic terrain creation in this part. This tutorial was made using 3ds max 5 so this way of doing things may not work in older versions. 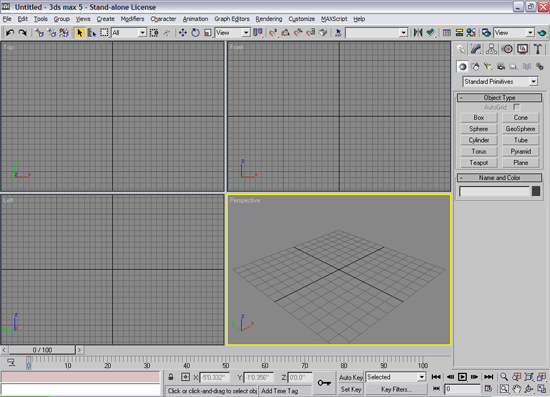 Below is what the main 3ds max program window looks like. 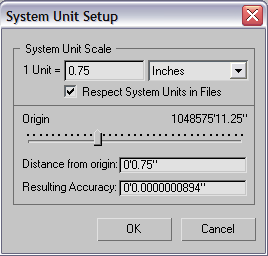 Now I'm going to set up Max to make it correspond to DEdit as far as the grid unit measurements go. Technically this has no real effect on how things will turn out in the end because one Max grid unit will always correspond to one DEdit grid unit regardless of how you set up Max. I like to use the US Standard measurement system because one DEdit grid unit is roughly 3/4 of an inch. To set up the units in Max click "Customize" on the menu then click "Units Setup...". A new window will open, shown below. 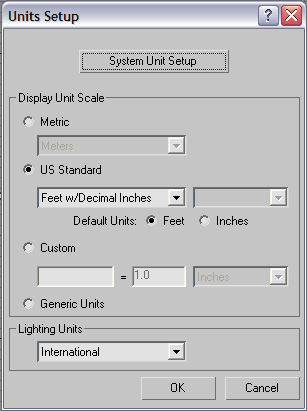 Click the radial button next to "US Standard" and in the drop down menu below that select "Feet w/Decimal Inches". Now click the "System Unit Setup" button at the top of this window. A new window will open, shown below. In the text box next to the "1 Unit = " type in 0.75. 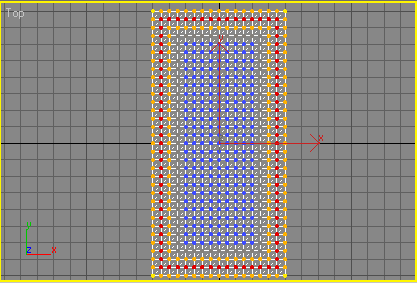 This will set the grid spacing to 3/4 of an inch, just like in DEdit. Click "OK" on each of the open windows to return to the main Max window. There's one last thing that needs to be done to set up the grid to be more like DEdit's. Click "Customize" on the menu then click "Grid and Snap Settings...". A new window will open, shown below. In the text box next to "Grid Spacing:" type in 0.75" (don't forget the quotation mark at the end). 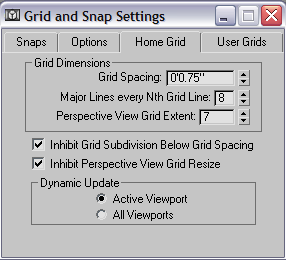 In the text box next to "Major Lines every Nth Grid Line:" type in 8. This will make the grid lines match up with DEdit's. Only difference is you change DEdit's grids by clicking the "+" and "-" keys and in Max it automatically adjusts the grid when you zoom in and out. Now click the X button to close this window and return to the main Max window. Now it's time to create some geometry. 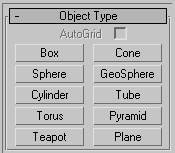 On the right hand side of the Max window (known as the "Command Panel") there is a list of buttons labeled with the names of different geometric shapes. Click the one labeled "Plane". New sections will appear below with options you can adjust. I prefer to manually set the dimensions of the plane, so to do that click the plus sign next to "KeyboardEntry". For this tutorial, type in 512 in the text box next to "Length:", and type in 256 in the one next to "Width:". Under the "Parameters" section enter in 32 in the "Length Segs:" text box, and 16 in the "Width Segs:" text box. This will divide the plane up into smaller square segments. Each square segment is made of two triangles. The higher the number of segments you enter, the more polygons that will be used to create the plane. Now you can click the "Create" button that is in the "KeyboardEntry" section and the plane will be created. Now I'm going to explain the basics of moving around in the viewport windows. To select a viewport window, simply click in it with the left mouse button. Now that viewport window will have focus. To zoom in and out, scroll your mouse wheel up or down. There's an alternative way of zooming in and out the view in a more precise manner by holding down the CTRL and ALT keys on your keyboard along with the middle mouse button, and then moving the mouse up and down to zoom in and out. To move left, right, up or down; click and hold the middle mouse button and move the mouse in the direction you want. Hold down the "CTRL" key on your keyboard while doing this to make the view move faster. The perspective viewport window also allows you to rotate the view. With the perspective viewport window in focus, hold down the middle mouse button and then press and hold the "Alt" key on your keyboard. Then move the mouse left, right, up, or down to rotate the view in the direction you want. Be aware that rotating the view rotates it about the middle point of the perspective viewport window. I am unaware of any way to move around in the perspective viewport in a first-person view like that of DEdit's. One last thing I do before starting to build the terrain is to have it show all of the edges of the triangles that make up the plane in the perspective viewport window. 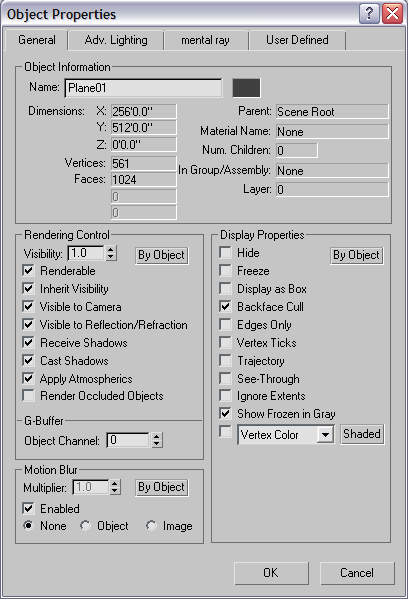 With the perspective viewport in focus click "Customize" in the menu and then click "Viewport Configuration...". 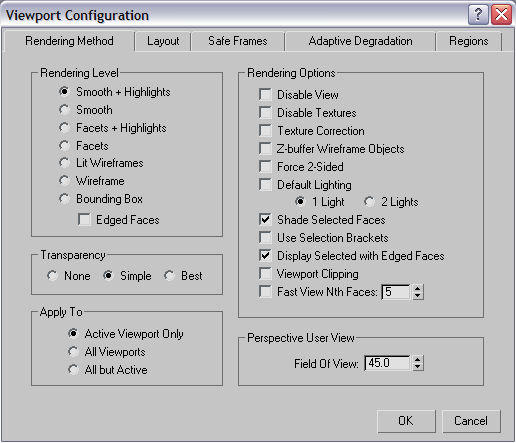 The "Viewport Configuration" window will open, shown below. Check the box next to "Display Selected with Edged Faces". I also unchecked the box next to "Use Selection Brackets", but that isn't really necessary and is a personal preference. Click the "OK" button to close this window and return to the main Max window. Now click "Edit" on the menu and then click "Object Properties". A new window will open, shown below. Uncheck the box next to "Edges Only". Click OK to close this window and return to the main Max window. Now it's time to make some terrain from the plane created earlier. At the top of the Command Panel, click the second tab from the left (it looks like a curve going to the right). This brings up the Modifier List. Modifiers are what allow you to manipulate the geometry you create in Max. Right now we only have a plane and you should see "Plane" in a list box below the Modifier List drop down menu, which is shown below. The name of the plane appears in the text box at the top of the Command Panel, the default is Plane01. If you wish to change the name of it you can type in a new name here. To change what color the plane is in the perspective viewport, click the square to the right of the name box to bring up the color chooser. Now right click "Plane" that is underneath the Modifier List and under "Convert To:" click on "Editable Mesh". Now "Plane" changes to "Editable Mesh" and will have a plus sign next to it. Click the plus sign next to "Editable Mesh". Here is where you select which parts of the geometry you want to manipulate. Selecting "Vertex" allows you to move the vertices of the geometry. "Edge" allows you to manipulate the outside edges of each triangle. "Face" allows you to manipulate triangles. "Polygon" allows you to manipulate the square segments that make up the geometry. I'm not sure what "Element" is, but it's not important here anyway since it will not be used in this tutorial. I'm going to start off using the vertex mode and turning on "Soft Selection". Soft selection will allow for the creation of smooth hills and valleys among other things. To do this, click on "Vertex", then click the plus sign next to "Soft Selection" to open that section. Click the check box next to "Use Soft Selection" and in the text box next to "Falloff" type in 48, as shown below. 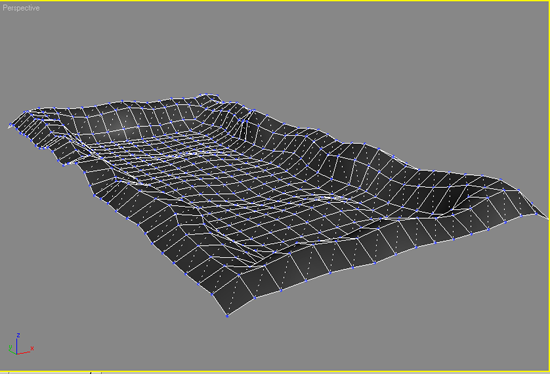 Now I'm going to select some vertices near the edge of the plane in which to create a hill around it. Select the top viewport. 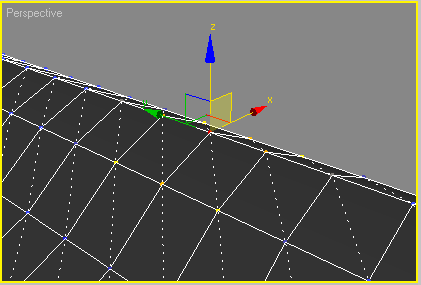 To select multiple vertices, hold down the left mouse button and drag the mouse over the vertices you want to select. You will have to zoom in the top viewport and line up the plane to do this. 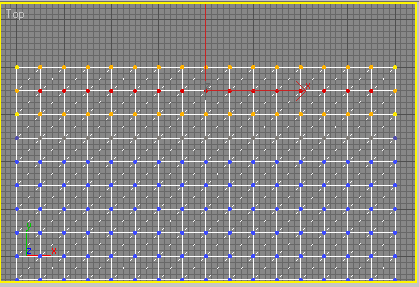 The vertices I'm going to select are one row in from the outside edge, as shown below. 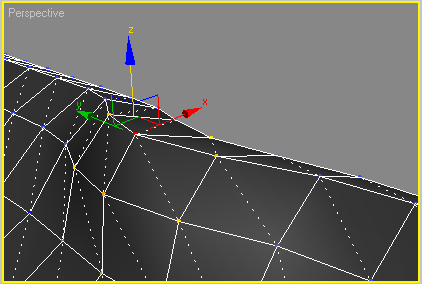 Now we're going to move these vertices up to create a hill around the edge of the plane. To do that, in the toolbar click the button that has the icon of a cross with arrows at the end of each point. Select the perspective viewport. You will notice there are now arrows pointing in different directions. This is what will allow us to move the selected vertices. Click and hold the left mouse button on the arrow that is pointing up and has a "z" above it. This will allow us to move the vertices up and down. Right now we want to move it up in order to create the hill, as shown below. As you can see, not only did the selected vertices rise up, but the surrounding vertices also were pulled up, although not as much. This is what soft selection does. 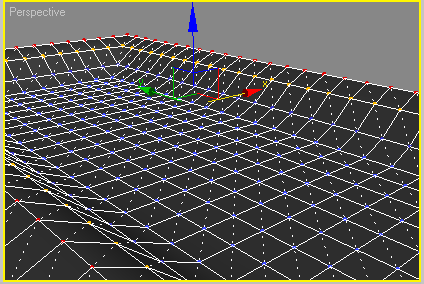 The effect of soft selection lessens for vertices that are further away from the selected vertices. You control how far out this effect goes with the number you put in the "Falloff:" text box. The higher it is, the farther out the effect goes. You can also adjust the numbers in the "Pinch:" and "Bubble:" text boxes and that will affect how the soft selection works. For this tutorial they both will be left at 0. If you want to move only the vertices that are selected without moving any of the surrounding vertices, uncheck the soft selection check box. Now we have a hill around the plane but it's pretty boring looking. 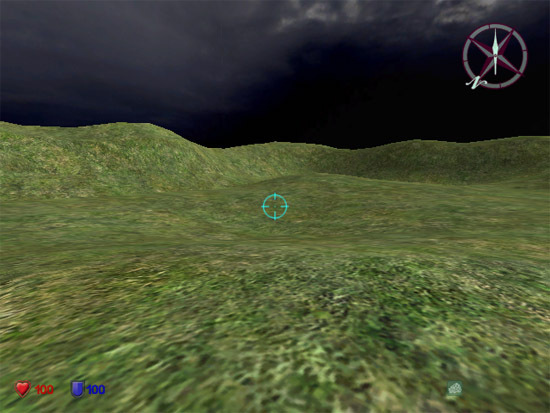 You can now select individual vertices on the hill to raise or lower to make more realistic looking hills. Simply left click on a vertex to select it. All other vertices that are selected will be deselected and the one you clicked will be selected. Now you can click the arrow labeled "z" to move it up or down, or you can click on one of the other two arrows to move the vertex in other directions. You can also move in two directions at once by clicking the colored squares that are located between the arrows. If you wanted to move the vertex in the x and z directions at the same time, click the square that is connected to the x and z arrows. When you move your mouse over that square, it will become filled with color, as shown below. When that happens, hold down the left mouse button and you will be able to drag the vertex around in both the x and z directions. And with soft selection on the surrounding vertices will move as well, as shown below. Now to save this file as an LTA so that it can be loaded into DEdit, click File...Export... and a new window will open. You will want to select LithTech World (*.LTA, *.LTC) in the drop down menu next to "Save as type:". Now type in a file name and select which folder you want to save it to. I just chose "TERRAIN" to keep it simple. Then click "Save" and a new window opens listing the LithTech World Exporter options. The only thing you really need to have checked is "Triangulate Brushes". Then click OK to export the terrain as an .lta. Then you simply open (or import if you have an existing map you want to load it into) the TERRAIN.LTA in DEdit and you can texture it to your liking (be sure to update the object properties when DEdit warns you about object properties being out of date). Below is what the terrain I made looks like inside of Contract J.A.C.K. This concludes the first part of the terrain tutorial. In the future I plan on covering more advanced terrain features like reducing polygon counts and how to do texture blending, among other things. Thanks guys. Texture blending will definitely be in the next part of the tutorial, I'm still deciding on what else I want to put in it though.